By all accounts, the state of Utah has proven itself a leader in addressing the problem of hopelessness. The state is among the first to eschew the strategy of putting treatment (i.e. getting sober or on the right medication) before permanent housing. Instead, Utah has forged a path called “House First” which finds people permanent housing and then addresses the deeper issues. That makes complete sense when you think about it. 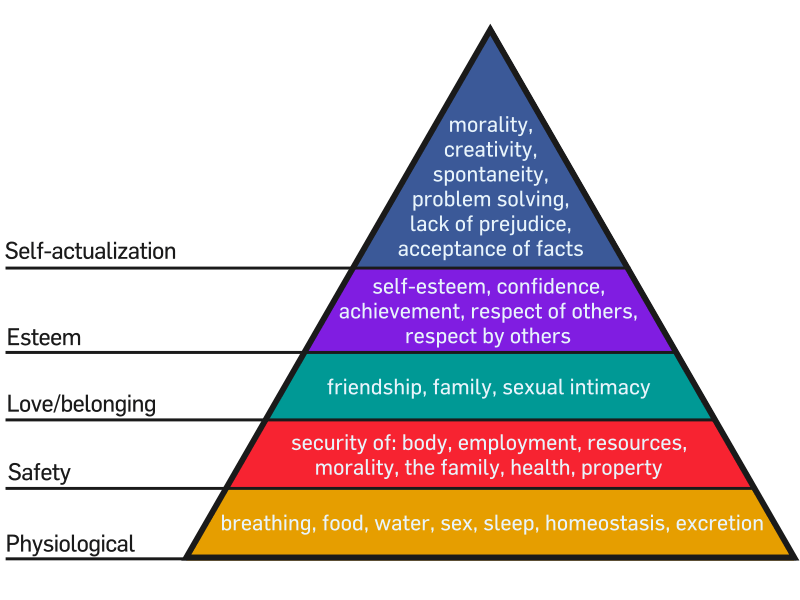 Do you remember Maslow’s Hierarchy of Needs? (See left) At the bottom of the pyramid are physiological (breathing, food, water, sleep, etc.) and safety (security of body, employment, resources, etc.) needs. Basically, when folks don’t get the basics, they can’t get to the point of addressing the higher level needs. Utah’s efforts were hugely effective, according to an Article in New Yorker. In a 2005 pilot, the state found that this approach was cheaper (supporting someone on the street cost $20,000 compared to $8,000 for housing them) and of the 17 people who were placed in the program, after 22 months none of those had returned to the streets. Each time I see them, these meters fill me with a combination of admiration and discomfort. I am inspired to see a community that is working to address the problem of homelessness head on and I appreciate the personal invitation to be part of the solution. 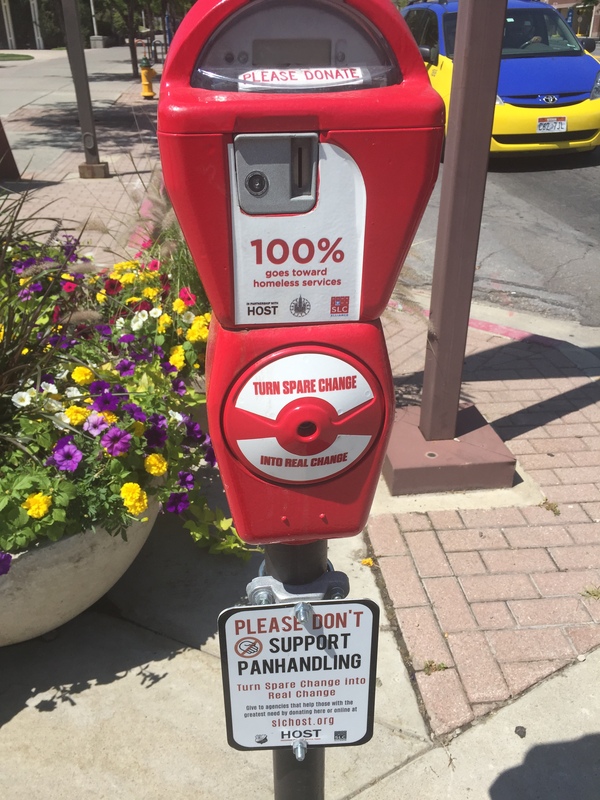 At the same time, I wonder if slipping a few coins into a slot in the parking meter will give people the feeling that they’ve done enough—and to walk past homeless individuals without giving them a second glance. In the baptismal covenant, Episcopalians promise to “seek and serve Christ in all persons” and to “respect the dignity of every human being.” Both of these promises are relational—and cannot be accomplished with a simple monetary transaction. Every day as I have walked to and from the Salt Palace Convention Center, I have encountered individuals who are asking for help. For years, I’ve struggled to figure out how to address these pleas in a way that aligns with my values and personal beliefs. I don’t think there are any universal answers—It’s a personal decision. In the end, I try to answer each person and look them in the eye as I do so. I carry protein bars with me—and I ask the person if they are hungry and if I might share my food with them. When my Starbucks or Peet’s coffee card gets down to just a few dollars, I sometimes hand it over to someone in need who asks—these places often sell sandwiches and other kinds of food, plus the benefit of hot coffee. An added benefit of this approach is that it lets the individual become a customer—someone with buying power and decision making opportunity. That has to add to one’s dignity. Smile. By being civil and polite, you recognize the dignity of the person. Point homeless people to available services. Various programs offer meals, shelter, clothing, medical care and other services. Get to know what programs are available. By knowing what’s out there, you may find more opportunities to help. Give generously to good programs. These programs help rebuild lives. They can’t do their work without funding. Enough said. Donate food and supplies. Ask your chosen organization what they need most—and then provide it. Volunteer. Much of the work of homeless programs depends on the support of community volunteers. Start a community service project. Invite your friends to donate and volunteer along with you. Many people want to help but don’t know how. Be an advocate. Let your elected officials know that you are concerned about homelessness and that you value programs that reduce poverty and assist people in recovery. Don’t be afraid to call the police. When someone’s safety is at stake (yours or others), do involve the authorities. First responders are trained to do more than uphold the law—they know how to help. Trust your gut—and don’t assume someone else has made the call. Better two calls than none. In the end, I’ve found peace with my discomfort about the parking meters. I’m grateful to see a community that is collaborative in its efforts to address this critical issue. And, at the same time, I embrace the opportunity to forge my own path. For me, this is not an either/or issue—instead, we can work as a community and respond on an individual level. In the end, that’s the path to supporting the dignity of every human being. Do you have anything to add to the tips above? And let me know what you’ve encountered with this issue in the comments section below. This idea is nothing less than brilliant! …a feel good for the giver and receiver! It strikes me that giving all year is an effective sustainable way for a community to care for ALL residents. Love it – thanks for another great blog, Hailey!